Various diseases and illnesses have plagued people for centuries, and Farmington, Connecticut, was not without its fair share. Disease often spread quickly in colonial Farmington. If one household became ill, chances were that several more would fall ill before anyone even had the chance to stop the disease from spreading. One of the diseases that spread the most rapidly during this time period was smallpox. Smallpox, named “The King of Terrors” by the United States’ second president John Adams, was a highly contagious disease, and lasted for several weeks. While many people died from the disease, the ones who lived were not entirely lucky. They were often left deformed, scarred, and occasionally blind. Because smallpox spread from person to person so quickly, an epidemic outbreak was extremely possible. One such epidemic occurred in 1771 and took many lives, including the life of Farmington resident Abigail Hart, who left behind her husband Stephen Hart. Abigail Hart was just one of the several victims of the epidemic of 1771 that was sweeping through New England. Tombstones were found near Colombia Lake in 1913. The stones were buried farther from town and all the people had died around the same time. This led people to believe that these stones were those of other people who died from smallpox in 1771. While smallpox spread quickly and often left behind lifelong effects, there was a way to prevent the illness, inoculation. People who were inoculated were given the illness in a small dose and taken care of until they healed. After they recovered the inoculation made them immune and they were no longer able to contract or spread the illness. While inoculations could help prevent people from getting the illness again, it was still a painful process, and there was no guarantee that the illness would not spread from the inoculation house, such as Hospital Rock in Farmington, to the general public in town. For this reason inoculation was the occasion of great debate. In addition to debating inoculations’ safety there was also the cost of inoculating people. Only the rich with strong family roots could afford the treatment. Thaddeus Betts, a physician in Norwalk, offered inoculations around the colony. Betts’ advertisement from 1771 lists the price of the inoculation as “three pounds lawful money,” which might be a month’s earning for an ordinary family. Rev. Timothy Pitkin was able to inoculate his daughter, Mary, because of his income as minister of the Farmington Congregational church. His doing so encouraged others with the means to follow suit. While smallpox was a major disease of the time, there were many other illnesses that spread quickly and killed many people. These illnesses helped the people of Farmington to solidify their faith in God, sometimes increasing church membership. One example of this was Polly Cowles, whose story is told through her sister Julia Cowles’ memoir. Polly Cowles was sick with consumption (tuberculosis) and had seen many of her friends die from the same illness. Her illness strengthened her belief in God, as she prayed to get well. Polly Cowles later died of her illness at age 17. Diseases in colonial Farmington were a major part of people’s lives; many died, lost loved ones or were scarred from illness. Despite the diseases that spread throughout Farmington the people remained strong through their faith and belief in God. 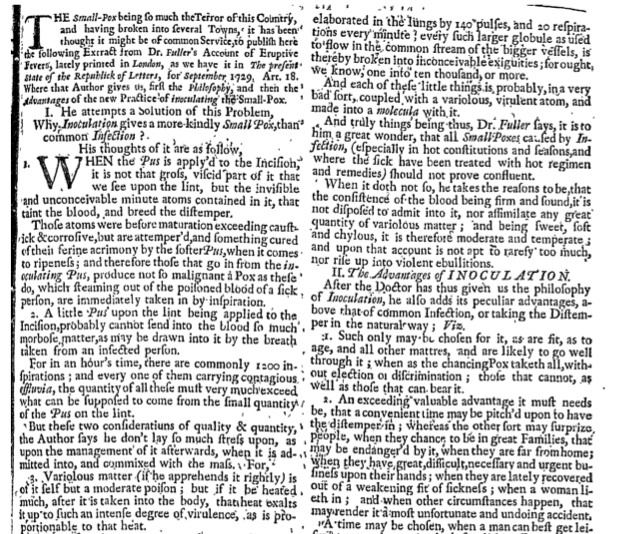 “Article 7 — no Title.” The Connecticut Courant (1764-1774), Jan 08, 1771. http://0-search.proquest.com.www.consuls.org/docview/552516289?accountid=9970. Betts, Thaddeus. Connecticut Journal, January 30, 1771. Special to The Courant. “Epitaphs About The Smallpox.” The Hartford Courant (1887-1922), Jan 11, 1913. http://0-search.proquest.com.www.consuls.org/docview/555963561?accountid=9970. “Memoir of Julia Cowles.” The Connecticut Evangelical Magazine 4 (July, 1803-June, 1804): 146-156. https://play.google.com/store/books/details?id=eq9_N_hHkBQC&rdid=book-eq9_N_hHkBQC&rdot=1 (also published by Yale Univ. Press, 1931, http://catalog.hathitrust.org/Record/001262388). Elizabeth A. Fenn, Pox Americana: The Great Smallpox Epidemic of 1775-82. New York: Hill and Wang, 2001.